In recent years I’ve befriended a number of talented American artists. 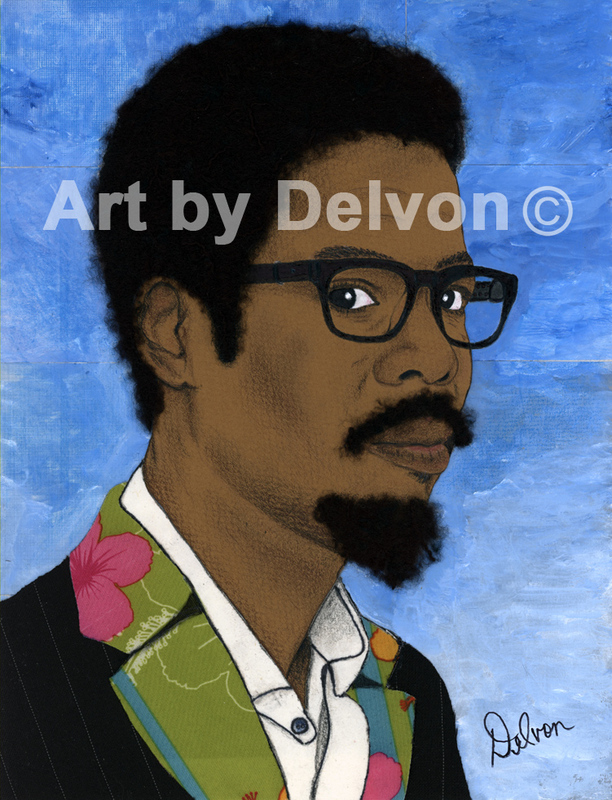 One artist I’ve grown to respect and admire is Mississippi born Delvon Cunningham, a self-taught artist with a great focus on mixed media work. Now based in Atlanta, he’s developing a body of work and exhibiting at venues such as the Southwest Arts Centre. Now a member of the RAW Artists Network, Delvon’s art was also featured at the RAW Discovery Show in Atlanta earlier this year. He agreed to share some thoughts on art and his aspirations. Q-How long have you been painting and what inspires you? Thanks David for including me in your Blog, it’s my great honour! Although I’ve been somewhat “creative” since grade school, my current body of work began about 6 years ago. Beforehand, I was designing greeting cards, all handcrafted. Card making really opened me up to the world of mixed media, while helping me develop a lot of self-taught skills and techniques I now use. Inspiration? hmm…this age old question is difficult to sum up. Ideas for my artwork can be quite random and eclectic, and I wouldn’t have it any other way. This is the great gift of being an artist, the freedom to express from a natural, organic space. You will find a timeless simplicity in much of my work. People inspire me a great deal, our individualism, inner spirit, beauty, personalities, style, and rich cultures. I’m convinced that we are genuinely fascinated with each other, one of the reasons I think people are drawn to my portraits. Q What is your preferred medium and why? I definitely prefer working with mixed media, as opposed to just one medium like paints, pencil or paper. I enjoy mixing it up a bit. Juxtaposing different mediums is fun and spontaneous, with unlimited possibilities. It can be unpredictable, especially if experimenting with a new technique but I love this element of surprise. Q You have a distinctive and admirable style. Can you explain the process you adopt for producing work such as Taste of Freedom? lips….so I called it “Taste of Freedom”. I used pencils, acrylics, ink and paper for this piece. Q How do you manage the commercial/income generating aspects of being an artist? Q We met through the Black Art in America initiative which provides a great platform to view black art. Whilst this is great, is its existence reflective of mainstream art galleries not representing a wide enough variety of art and artists? Yes we met via BAIA, a great network of artists and art Lovers. I personally haven’t had those thoughts about the network. I haven’t known BAIA to discriminate based on someone’s art form or style. Membership is pretty much open to all visual artists as far as I can tell. They featured my work shortly after I joined, which was a huge honor for me. To me, its helpful tool to connect, network and market – which is pretty much self- driven by how much, and how well one engage the site. I did not join BAIA to have them “represent” me like a gallery would. 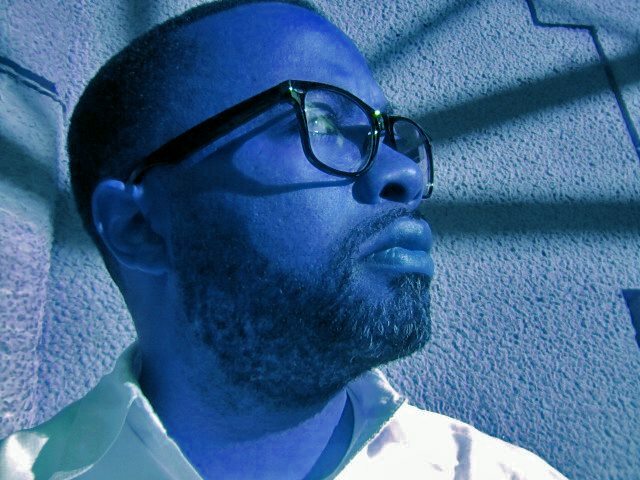 I joined to connect with creative minds like you. DEN- I wasn’t implying there’s a restrictive process executed by BAIA, far from it. My question explores the mainstream art world; is there an adequate celebration of quality artwork representing the African diaspora in public galleries? Yes absolutely, I believe its existence speaks to the large imbalance of representation between black artists and other groups. BAIA is a pretty large network and still growing. I think this is because there aren’t many networks committed to promoting the African diaspora in visual arts. Q I love your image TASTE OF FREEDOM 2. This is a powerful and thought provoking piece. Your work reflects and celebrates the African American experience. How important is the visual artist in modern day America? Thanks David, this piece is an extension to the first “Taste of Freedom” piece I did. I will certainly continue the “Taste of Freedom” series, depicting situations associated with black people in America. 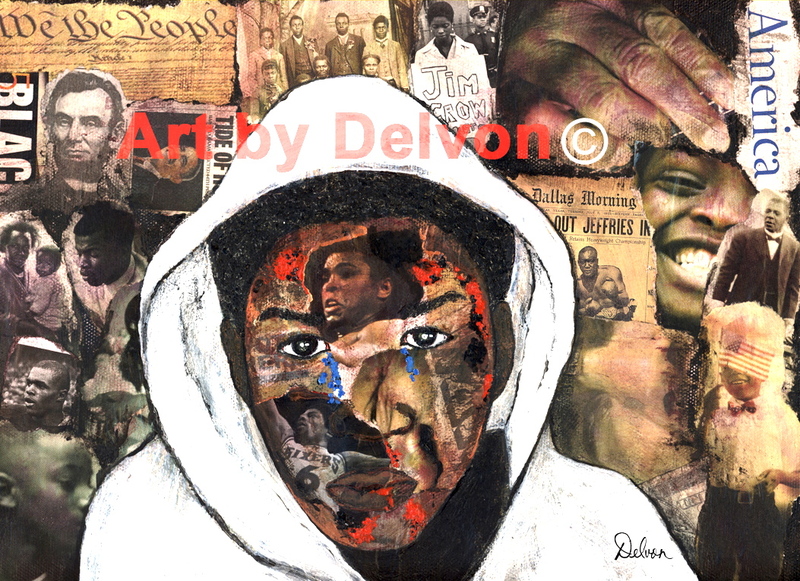 ” Taste of Freedom II ” features a young Trayvon Martin wearing the all too familiar hoodie. The background gives somewhat of a visual commentary via photo collage, with glimpses of Pres. Lincoln and Obama, a pic from Jim Crow era, Boxers Ali and Jack Johnson, among others. It’s meant to provoke thought and dialogue around our journey, and the state of our Freedom in America today. Visual artists often communicate ideas/feelings that cannot be expressed in words. That’s a powerful thing! The idea that one can manipulate paint or shape clay that overwhelms us with emotion- what a miraculous power to behold as an artist! I think it’s good for visual artists to bring forth their best Self, and pour it into their works. 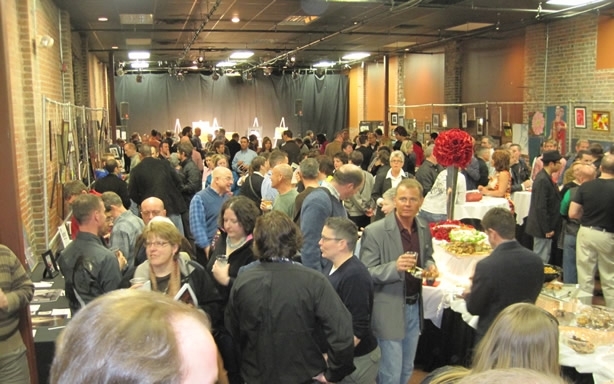 Art plays a hand in shaping pop culture and social dialogue. That’s pretty important. Q You say you want to work with and positively influence young people; how have or will you be doing that? Yes sir, it is essential to invest in, nurture and inspire our youth. This principal is really a way of life that I continue to cultivate. As my art brand grows, so will more opportunities to use my art to collaborate, and work with other causes and organizations that focus on the needs of youth. I want to also support art and music education in schools. Kids should all have the opportunity to build on whatever creative interests they may have, other than just sports. Q So what projects are you currently working on? There are a couple of new works currently in the making, with some exciting new techniques I’m having fun with. Many recent works can be seen and purchased at: http://delvon-cunningham.artistwebsites.com/…I started a Facebook Group about a year ago, “DISCOVER BLACK ART. As it continues to grow, I want to expand that community on the Internet; I think there’s some potential there to do some great things with my fellow artists. Q What career aspirations do you have for the immediate future? At the moment, I’m engulfed in creating and growing my body of work. I have so many great ideas to bring forth. Stay Tuned!! I wish Delvon the very best with his career. I’ve had a relaxing and entertaining weekend. I did some drawings, attended the Canary Wharf Jazz festival and was fortunate to see Chiwetel Ejiofor as Congo’s Prime Minister Patrice Lumumba in “A Season in the Congo” by Aimé Césaire. BAFTA Award winning director Joe Wright directs the play. I’ve always known Olivier Award winner Chiwetel Ejiofor to be a great actor. Along with a fine cast, his performance contributed to an engrossing play that successfully documents Congo’s path to democracy. 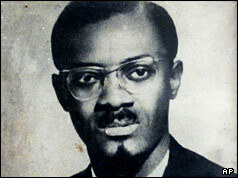 Patrice Lumumba served as the first democratically elected prime minister of the Democratic Republic of Congo for less than three months in 1960, when it gained independence from Belgium. He was murdered by rebel troops (with growing evidence of Western support) soon after he won it. The production places events of the early 1960s in a wider, historical and political context, capturing the paranoid atmosphere of cold-war politics between the Soviets and the US, the ineffectiveness and neutrality of the United Nations and the forgotten brutality of the Belgian colonialists. The power and importance of theatre is definitely illustrated as it allows us to remember historical events we in the western hemisphere tend to forget. It encourages us to understand the role of colonists in undermining the path to democracy and self -determination for African states. My only upset is that the play doesn’t go far enough in referencing the extent of the Congolese holocaust, initiated by Leopold II of Belgium. Although the exact figure isn’t agreed, the consensus is that Belgian Colonists killed about 12 million Congolese in the 1900s. The Belgians left the nation in such a mess that after the country’s independence millions more died in a series of wars. The assassination of Patrice Lumumba left successive ineffective governments overseeing wars that have in total killed over 5.4 million people, mostly through disease and starvation. Congo has seen the biggest conflicts since World War II. It’s fair to say Patrice Lumumba’s memory still haunts the country after 50 years. A Season in the Congo is a suitable tribute to a leader who held the hopes of what seems to be lost nation. The play runs until Aug 24th at London’s Young Vic. For further details please visit http://www.youngvic.org/. Well, looking forward to a busy and creative week ahead. Wishing you all a safe, happy and prosperous week. 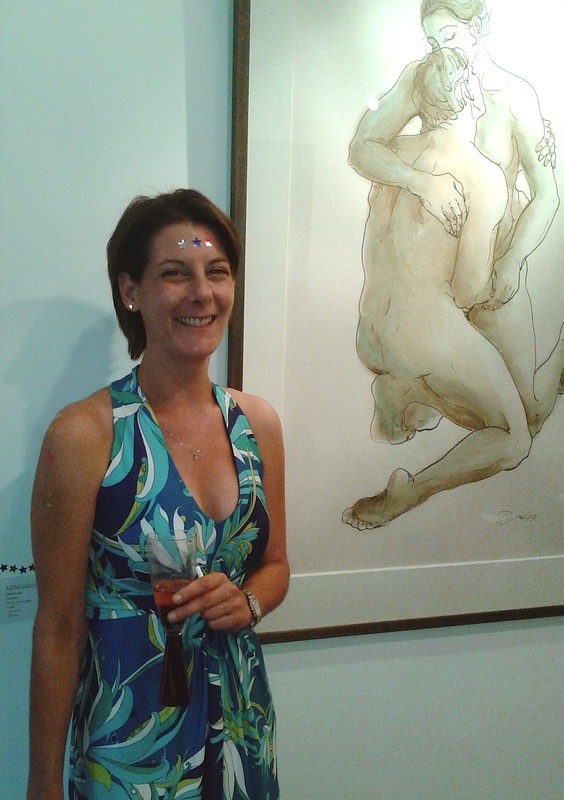 This week I attended the Fiumano Fine Art Gallery’s summer exhibition. I can’t say I’ve ever been to this gallery’s summer shows before because, particularly in recent years, I’ve spent this time of the year in New York. Nevertheless, it’s always a great pleasure to see friend and gallery owner Francesca Fiumano doing what she loves and presenting the work of some great contemporary artists. During the private view on the 6th August and throughout the exhibition, Fiumano Fine Art will be inviting friends and collectors to select their favourite exhibit and leave interactive comments about the exhibition on the gallery’s front window. The artist who receives the most votes will have a larger selection of work displayed during the gallery’s Finissage party on the 14th August. The exhibition features some great and thought provoking work by gallery artists including Roger Holtom, Rosana Ibarrola, Maud de Jeu, Kathy Ramsay Carr , Takefumi Hori and Andrea Patrisi. I was particularly drawn to the work of British artist Richard Farrant. The fluidity and movement of his work is clearly represented in the charcoal work featured in the show. If you are in the area please visit the exhibition. This summer has been a productive and unpredictable one in many ways. I’ve spent most of it in my studio, lost in the process of creating a new body of work. I’ve also spent more time exploring the world of investments, stocks, shares and the science of trading. The areas I’m keen to follow include alternative investments and the so called ‘ SWAG’ assets that are silver, wine, art and gold. It’s very clear why ‘ SWAG’ assets are growing in popularity. The increase in household, financial and government borrowing over the 2000-2010 period created a false illusion of prosperity. Our trusted banks became convinced of their own ability to control the business cycle and our governments allowed institutions and households to act recklessly. The problem was caused by the creation and availability of too many things, coupled with a false belief we needed everything available in the big consumer market. There was always too much supply plus an artificial demand created by excess borrowing to satisfy excess supply. Many of the gains reaped by investors in the last decade or so have been a result of strategic diversification of their holdings and exploring a broad range of asset classes. A new use for art has emerged, where it is undoubtedly as a solid investment. Purchasing art has always been something the more sophisticated and well informed investor has exploited (This is evident with record breaking sales at Sotheby’s and Christie’s auctions) but it is becoming more prevalent amongst those with less knowledge of the sector or without large portfolios. SWAGs outperformed other equities during times of economic downturn because they provide the profitable principle of “scarcity economics” and the value of art is partly related to its uniqueness. Moreover, in an unsteady market, people will be drawn to stabile assets that may be bought and stored indefinitely. Most importantly, as their returns are not related to the patterns of the stock market, they add a sensible diversity to any portfolio. Investors are looking to protect themselves from losses by increasing the ratio of non-correlated instruments in their portfolios and art wealth management companies are readily available to assist art buyers with their overall wealth management strategy, helping to develop bespoke art portfolios that demonstrate high potential for value creation. Looking at the global economy and the art market is very interesting. Art Sales Reached £40 Billion In 2012 Outperforming the Equities Market. As global wealth grows exponentially beyond the US, UK and mainland Europe, the art market has become more globally influenced than ever before. Fuelled by triple-digit growth in recent years, China has overtaken the U.S. as the world’s largest market for art and antiques, representing 30% of the global market in 2011. The 2012 RBC/Cap Gemini World Wealth Report states Asia-Pacific surpassed North America in high net worth individual population to become the largest HNWI region for the first time. With newly acquired wealth, demand for luxury goods increases. As emerging markets become wealthier, the art market is likely to continue to be comprised of a much more diverse set of art buyers. This is generally good news for the art market. There’s a lot to discover about the art world, the amount of money in the industry and the potential to have a slice of the pie.